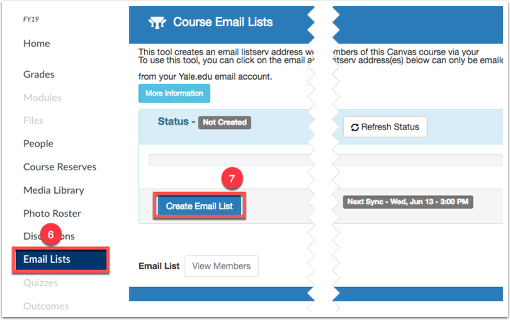 Canvas @ YaleInstructor Guides External Apps to use with Canvas @ YaleHow do I use the Email Lists tool? The Email Lists Tool is a tool that generates an email address for you to use to connect with the users in your course. The email addresses provided by this tool can only be emailed by official Yale email address of the instructors and TAs listed within the course site. Email list members are updated daily every 2 hours. Instructors/TAs can email all the course lists by default. If an instructor limits the TA’s course privileges to their enrolled section, then the TA will only be able to email sections they are enrolled in. 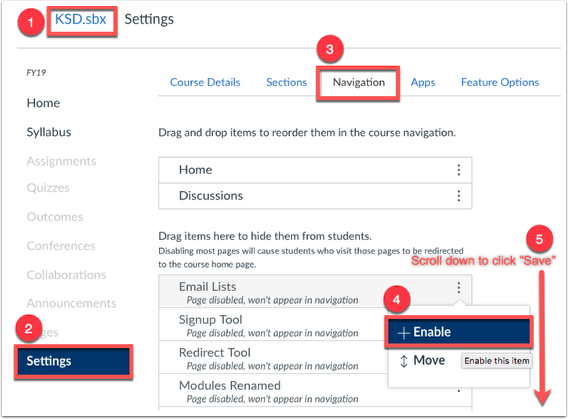 To use the email list tool, you must first add it to your course navigation. Click the dots next to the Email Lists Tool, and choose to enable the tool. 6. The email list tool will now appear in your Course Navigation. 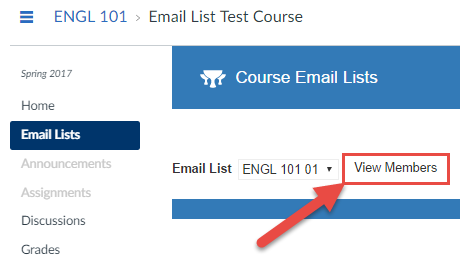 Within your course navigation bar, click the "Email Lists" button. 7. Click "Create Email List". A new list is created and members populate. An update will run that picks up the change in enrollment in your course, this will be reflected every two hours. The “create email list” button will become disabled once pressed. Once you have selected a list, click the "View Members" button. You will now see a full list of all of the people who are part of this list and the email address associated with each member. At the top of the page, you will see the email address that you can use to email this group of users. Click on the email address or you can highlight and copy the email address. TIP: You can also click on an individual user's email address to send an email to just that user. Now go to your preferred email client (recommended email client is Outlook). Compose a new message and paste the email alias into the "To:" area. Fill in the Subject and Content of your email and send. When you send a message to an Email Lists address, you will receive a copy of your message. Your copy will only show the Email Lists tool address in the "To" field. When you compose your message, paste the email alias into the "BCC:"area**. Once you have pasted the email address, wait a few seconds and then you will see a "+" symbol appear just before the email address. Click on the "+" symbol to expand the list. You will then see a pop-up warning telling you that the email address you pasted will be replaced with the individual members. Click "OK" to continue. You should now see the list of the individual email addresses. ** - You will want to make sure that you do use the BCC area if you expand the user list. This will make sure that the students will not see each other's names/email address and will not be able to reply to the entire list.